At LeaseHawk, we're thrilled at the success we've been able to share with you this past year. Here's how the multifamily industry stacked up in 2018 and tips for 2019. Since the new year has begun, take some time to look back and reflect on your biggest moments and goals accomplished in 2018. At LeaseHawk, we are thrilled at the success we’ve been able to share with you last year. So, we have rolled up a snapshot of 2018 industry data to reflect back on that success and how we can help you to improve in 2019. 11.2 million of the industry’s inbound calls were tracked by LeaseHawk this year, an increase of 23% from 2017. Of these calls, leasing offices missed 43% of calls—unfortunately missing 1.5% more calls than the prior year. It’s apparent that demand for multifamily housing is continuing its momentum; however, leasing offices are missing more calls than ever. In 2019, consider adding a conversational voice assistant that can help property managers take control of the demanding volume of calls received on a daily basis. Unlike traditional call centers, conversational assistants are more cost-effective and consistent and can handle important interactions with prospects, like collecting guest cards or setting appointments. Handled over 28,200 prospect calls. Created more than 8,500 guest cards. 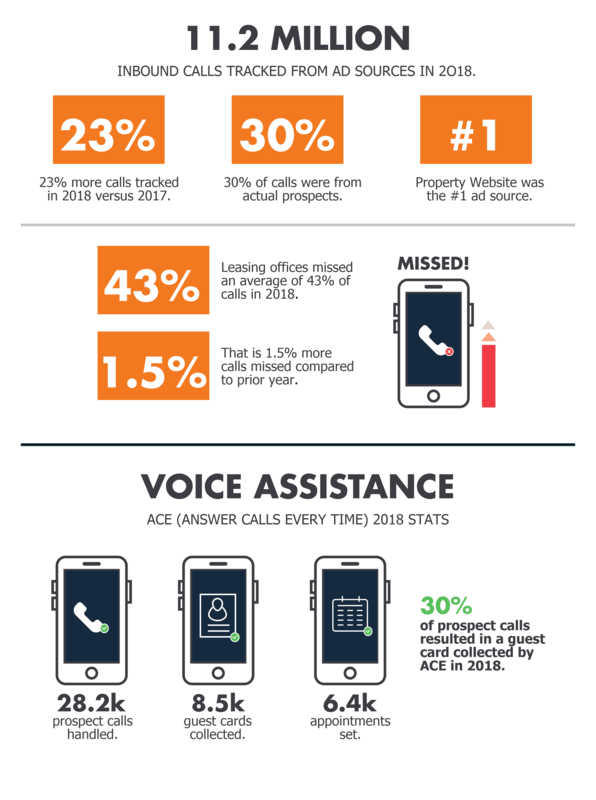 30% of prospect calls results in a guest collected by ACE in 2018. At LeaseHawk, we listen to the voice of your customer—literally! This year we analyzed more than half a million calls with prospects. These calls were scored using a survey of best practices created by industry professionals, so multifamily property owners can easily identify the areas that need improvement and overall employee call performance. Of these calls, leasing professionals converted on average 39% of qualified calls to an appointment and earned an average of 55% as the overall call performance score. Top leasing professionals typically convert 50-60% of qualified telephone traffic. Use TPA (Telephone Performance Analysis) results to discover where your leasing professionals need additional mentorship, such as introduction and lead information, pricing, qualifying questions, amenities, and benefits, or closing to help them improve on conversion. Create a monthly recognition program based on TPA results as an incentive to motivate your leasing team. Implement a Customer Relationship Management (CRM) system to improve follow-up. See how one LeaseHawk client did this in 2018 to improve response time by 95%. Measuring leads and performance from phone calls is one of the most under-recognized opportunities according to a study by BIA/Kelsey. They project 169 billion mobile calls annually to businesses by 2020, driven primarily by the natural hand-off between mobile engagement and phone calls, such as click-to-call buttons. (Source: BIA/Kelsey, Call Commerce: A $1 Trillion Economic Engine). By measuring call analytics, the apartment industry can unlock value through contextual awareness of call quality, such as knowing a caller’s intent or an employee’s level of helpfulness—all of which contribute to an improved ROI. Looking ahead, we plan to deliver a range of advancements and refinements in the coming year including lead scoring phone calls powered by artificial intelligence, visual voicemail, increasing the LeaseHawk CRM’s abilities and providing more advanced demand analytics. And with your feedback and continued partnership, there will be so much more on the horizon. Here’s to a bigger and better 2019. Ready to see LeaseHawk in action? At LeaseHawk, we listen to the voice of your customer—literally! See a snapshot of how the industry performed in 2018 with overall statistics on Telephone Performance Analysis (TPA) and much more. Plus, get a look ahead on what to expect from LeaseHawk in 2019 with tips to help your properties. In an increasingly competitive field, with disruptors like Airbnb in the periphery, it’s important to know the trends to watch in multifamily housing. Here’s a look at the top nine expected to make a major impact soon. 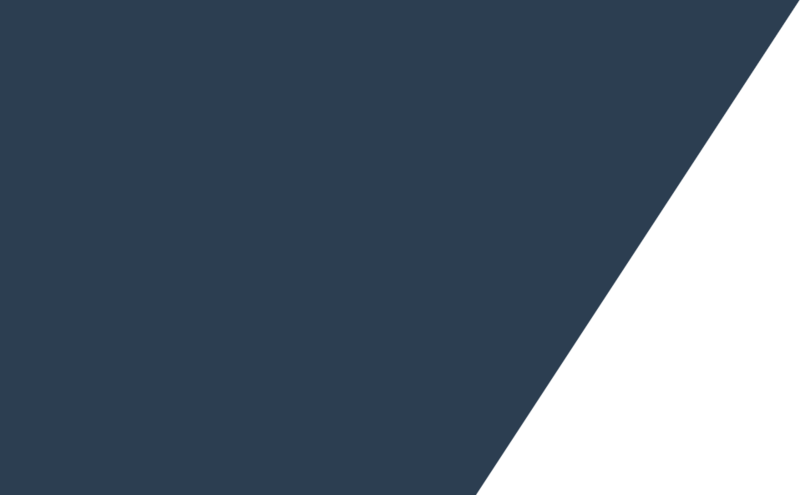 Learn how LeaseHawk’s AI-powered lead scoring solution can help properties make better marketing decisions and close more leases. Learn how management companies can increase their ROI with AI solutions to drive cost efficiencies and improve leasing success with three AI (Artificial Intelligence) solutions. LeaseHawk was honored to be a part of the first annual Multifamily Leadership Women’s Summit 2019. More than sixty multifamily professionals were hosted at LeaseHawk Headquarters for an afternoon of networking and three mini-sessions focused on technology for the multifamily industry. How Many Touches Does It Take to Close a Lease? It’s rare for a prospect to sign a lease after just one interaction with your property, which means follow up from your leasing agents is key. It takes an average of four to six outbound communications for every inbound communication to close a lease. Get the latest multifamily news, how-to's, infographics and more delivered right to your inbox. Copyright © LeaseHawk. All rights reserved.